Tharo, meaning three in Sesotho, is a collaboration between 2 very unique properties namely Egerton Game Reserve, owned by Amie Venter and Mattanu Private Game Reserve, run by the Kriek family. The third and most important part of the association is the client, as we believe our properties, along with each client’s needs and expectations, are core to our business. Our combined experience in conservation and hunting of over 60 years motivated the establishments to combine efforts and formalise a fresh approach to present to the hunting fraternity. Both properties have a unique habitat and presents a different environment and selection of species. Great food, wine selections, hospitality, activities and owner involvement come standard at these properties. Tharo Safaris believes in rendering a complete service and experience equal to none and with a combined size of 24000 acres of privately owned land, these properties have developed the whole wildlife value chain in the very successful wildlife economy and conservation story of South Africa. 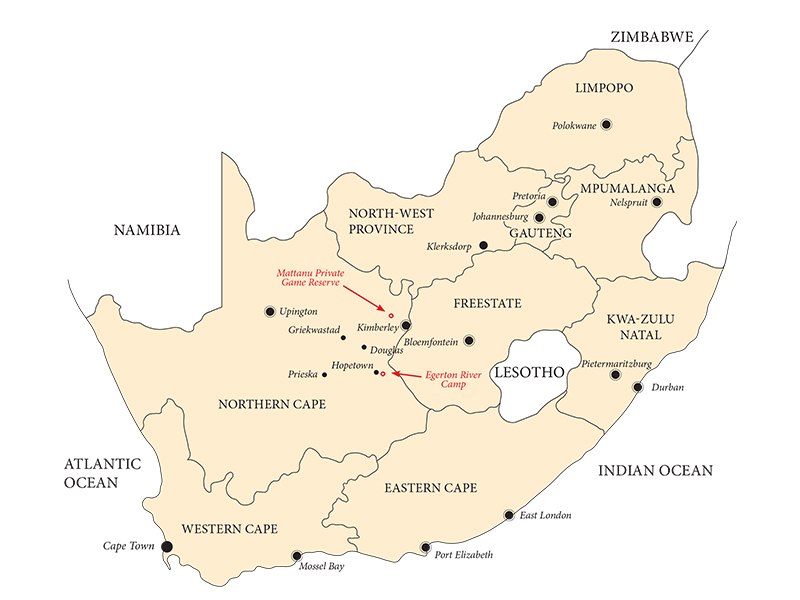 Central South Africa’s Northern Cape province/state is known for its diversity in cultures, habitats, species, friendliness and boast with the lowest crime rate in South Africa. The province is free of Malaria and the most sparsely populated state in SA and with Tharo having access to numerous hunting areas, accounting for thousands of acres in the province and nationally, we will endeavour to meet your every trophy and habitat preference. Both areas are within 150km of the Kimberley airport and easily accessible by road or air transfer. With Johannesburg about 450km to the north and Cape Town about 900km south, Kimberley is accessible by commercial airplane from all major airports within 1-1.5 hours. We are a family friendly destination with numerous activities and experiences catering for the whole family so whether traveling alone, with a group of friends or family we are the preferred choice in creating your ultimate African safari.